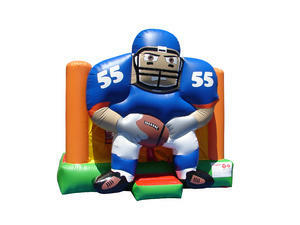 This awesome 3D bounce house is great for sports themed events/occasions. Book Football Guy for your next party. This roomy bounce house rental features a 13ft x 15ft bounce area so there's plenty of room for everyone. Out front there's an inflatable safety ramp to protect excited kids and they scramble to get inside, the vinyl is fire resistant for safety and all around there are large netted vented windows that keep things cool inside for the kids, while allowing parents to keep a watchful eye on all activities.